"This recipe for maple-brined pork roast is a delicious way for you to experience just how easy a simple brine really is. I love the way the meat gets infused with that subtly-sweet maple flavor." Mix water, salt, 1/3 cup maple syrup, garlic, ginger, rosemary, black pepper, and red pepper flakes in a large bowl. Place pork loin in brine mixture and refrigerate for 8 to 10 hours. Heat vegetable oil in an oven-proof skillet over high heat. Cook pork, turning to brown each side, about 10 minutes total. Transfer skillet to the oven and roast until pork is browned, about 40 minutes. Mix 2 tablespoons maple syrup and Dijon mustard together in a small bowl. Remove pork roast from the oven and spread maple syrup mixture on all sides. Cook for an additional 15 minutes, until the pork is no longer pink in the center. An instant-read thermometer inserted into the center should read 145 degrees F (63 degrees C). 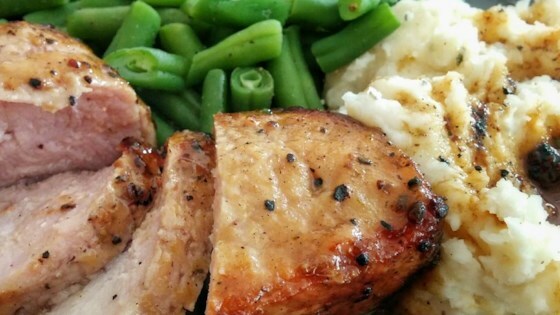 Make a simple brine and delicious maple glaze for roasted pork. Take care not to brine the loin for longer than 10 hours. So good I think my husband wants to marry me all over again...!